The squat: the foundational movement. We can’t work on it enough, and because time is often so limited, the front squat and overhead squat are often trained independently of the air squat and become—in the minds of the kids—distinct movements of their own. And when kids don’t see the compatibility between these different kinds of squats, the possibility for movement inconsistencies arises. Keeping all this in mind, I came up with the five-point squat drill as a way to reinforce the points of performance of these three foundational movements in an efficient manner that allows trainers to easily spot and correct some of the most common mechanical flaws, keeps children engaged so they remain in the bottom of the squat longer than they might otherwise, and demonstrates to the kids the continuity between the air squat, the front squat and the overhead squat. To begin, the three squats are taught as separate movements. This allows kids to better absorb the differences in each movement. 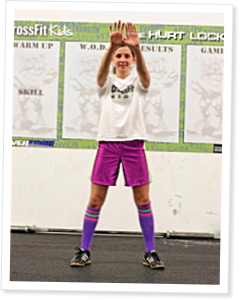 Once the kids have been introduced to the air, front and overhead squats—and this does not have to occur during the same class—the movements are brought together in the five-point squat drill. Jeff Martin shows his progression for teaching young kids how to air squat in this video captured at the CrossFit Kids certification seminar on July 28, 2008. Kids cues should be fun, but they need to be precise and effective. Mikki Lee Martin explains. At a CrossFit Kids Trainer Course, Todd Widman of HQ Seminar Staff discusses how teen weightlifting should be structured for safety and efficacy. Zach Even-Esh, owner of the affiliate Underground Strength Gym, has found success training young athletes. His programming is tailored to help sport-specific young athletes step up their game. Great article. Definitely some key notes to keep in mind that this isn't just for kids it's also for senior adults who might have mobility issues. Good Stuff... love the cues and for us parents/ teachers and trainers, it's imperative to know WHY and HOW to teach the movements to properly relay that information.